News from the motherland. CMC does Nashville with resident reporter Annie Kennedy. 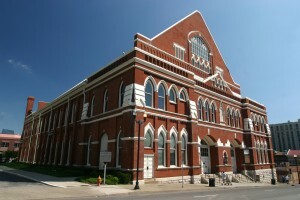 The Grand Ole Opry is back at perhaps its most historic location, the Ryman Auditorium, again this week. These shows are always full of amazing country talent, but seeing the show from the pews in the “Mother Church of Country Music” takes it to a completely different level! On Friday the 27th, catch Josh Turner, the Del McCoury Band, and Casey James, along with other opry members- you never know who might make an appearance! When it’s not hosting the Opry, the Ryman Auditorium, the house that built country music, lends its historic stage to other concerts and events.This Thursday, catch LeAnn Rimes as she hosts the Texaco Country Showdown. This event is free, and a really unique opportunity to catch artists that may be the next big country star! Past winners include Rimes, John Michael Montgomery, Chris Young, and Miranda Lambert. On Friday the 27th, you can catch 4 Superstar writers and artists at the famed Bluebird cafe, early home to some of Nashville’s biggest writers. Matraca Berg (“Strawberry Wine” by Deanna Carter), Kim Carnes (singer of “Bette Davis Eyes” and writer of “The Heart Won’t Lie” by Reba and Vince Gill), Lori McKenna (“Fireflies” for Faith Hill), and Barry Dean (“God’s Will” for Martina McBride) will be playing a benefit show for Alive Hospice. This is a great opportunity to hear some of our favorite songs in a whole different light. Nashville writer Sarah Buxton, who gained fame with both her own releases such as “Outside my Window” and “That Kind of Day,” and cuts by Keith Urban (“Stupid Boy” and “Put You in a Song”) is hosting a new kind of show- the UNCUT series. Check her out at 3rd and Lindsley as she plays her best unknown songs, that are just waiting to be cut, and could be the next big radio hit! Catch some of Nashville’s best studio players every Monday at the Station Inn. The session-player supergroup The TIme Jumpers plays Western Swing and Traditional Country at this unique music venue that truly takes you back in time to the Golden Era of Country music in Nashville!